Roulette ball has to be of a perfect sphere form and unbiased. It is interesting that almost each game has the main equipment and the accessories. Accessories or additions can be different. If for the computer games, the good accessory would be earphones, for the roulette it is a bit different thing. Let us try to count what we should have for the good home casino. 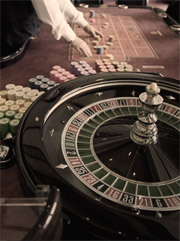 The most important and essential things for the roulette game are the roulette wheel, table and the layout on the table. Since we have all that, let us remember what else comes with the good old game. Ball. It is a very important accessory in the game, without it the entire game loses its point. It can be plastic, wooden (more like a vintage thing, as the wood can be easily dented) or metal (which is quite heavy and can damage the wheel pockets). Rake. It looks like a rake we use to collect the leaves, which fell off the trees. The rake is used mostly in the European casinos. The dealer or croupier (French for the dealer) collect the chips with it, while in the United States they mostly use their hands to collect everything from the table. Dolly, or win marker. This accessory is used to mark the winning bet. It is used to mark the straight bet, which won. The dolly is put on top of the chips. If there are no chips on that very number, it is simply put on the number. The dolly can be made either of plastic, acryl, wood, glass, crystal or anything else. The form, which we can most frequently meet, is a cylinder. Actually, it should something that we can easily see. The colors are up to your choice, but again, we can mostly see the transparent dollies. Chips. In this case we mean the plastic tablets the people play with the roulette game, not the potato or corn ones. In the American casinos the chips are of different colors. It makes the game easier for the players and the dealer. In European casinos you can see that the chips are of the same color, which makes the game really difficult to play, especially if you make multiple bets. You can buy for your home casino the ones you like with different prints on them. It is a matter of taste and preferences. Chairs. There is a great variety of the chairs and stools for the roulette game. Well, the most comfortable is a chair, because there are no arm rests and it is easier to stand up and your clothes would not be caught by it. What concerns the stools, there is no back of the chair, which puts extra pressure on your back to keep the same position.